iCE40 is the first FPGA family with completely Free and Open source software tools thanks to Clifford Wolf who put incredible amount of time to create tool which compiles Verilog code to iCE40 bitstream by reverse engineering the output of the closed source Lattice tools. As soon as we saw his presentation at FOSDEM we decided that we should make iCE40 FPGA board to use with his IceStorm tools. The result is iCE40HX1K-EVB completely open source hardware board with all CAD files on GitHub. Which could be programmed with IceStorm! In the next tutorials we will teach you how you can program iCE40HX1K-EVB with any other board or processor which have SPI, but we will start with Arduino-Leonardo or our equivalent OLIMEXINO-32U4. OLIMEXINO-32U4 is also OSHW board and all CADs are available, Arduino IDE is also FOSS. CABLE-IDC10-15cm to connect between boards 1. and 2. USB-MINI-CABLE to connect OLIMEXINO-32U4 to your host computer where you will install Clifford’s IceStorm and will build your verilog code. optional but highly recommended USB-ISO – after burning several USB ports on laptops and desktops while playing with development boards now I’m very careful and do not connect anything directly, its very easy to drop tweezers or wire or drop of solder on top of the development board while it’s connected to your computer and the result is USB damage and expensive repair.USB-ISO saves all these troubles and isolate your precious computer from problems with shorts, over voltages etc. If everything completes with no errors – congratulations you successfully installed the IceStorm! Now we have to prepare OLIMEXINO-32U4 as our FPGA programmer. Download latest Arduino IDE . We recommend you to use the one from arduino.cc current revision is 1.6.9. Copy iceprog.ino sketch from GitHub to examples folder. From Tools menu select ‘Arduino Leonardo’ as board. From menu Sketch–Include library–Manage libraries check if you have SPI and SPIFlash libraries installed if not install them. If everything complete without error now you have OLIMEXINO-32U4 set as iCE40HX1K-EVB programmer! If everything finish with no error you will see LED1 and LED2 blinking on iCE40HX1K-EVB. Congratulations! You made blinking LED on FPGA! Now check what is the content of example.v , ice40hx1k-evb.pcf and Makefile and learn why the LEDs blink and what happen when you press together BUT1 and BUT2? 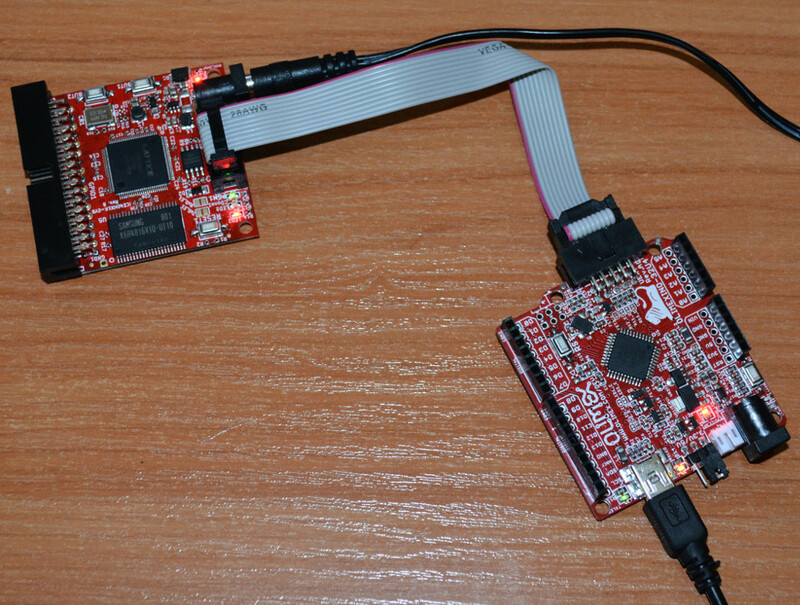 Next tutorial will be how to use iCE40HX1K-EVB with A20-OLinuXino-MICRO as both host for the IceStorm tool and programmer via UEXT connector with just cable and what additional options it gives like loading the code directly to FPGA whthout using SPI flash and your can change FPGA code in milliseconds. Previous Quiz Answer- smallest unit in KiCAD Next TuxCon conference about free and open source software and hardware technologies is this weekend! Seems like everything went well, the LEDs are on but they are not blinking. Pressing buttons does not have effect.